Instructions: The card base measures 7 inches by 5 inches. To make the card base, cut white card stock 10 inches by 7 inches. Score at 5 inches on the longer side and fold. Cut a pattern paper 1/4inch smaller in dimension than the card base from the paper collection that has a yellow background . Adhere to the card front using foam tape. Cut a die cut from Intricate frame die set. Remove the inside frame with a paper cutter. Cut a piece of white card stock that can be added as a backing to the frame. Distress this with Peeled Paint ink and score at 1/8 inch intervals on the scoring board. Cut a zig zag design from the paper collection using the coordinating die and add to the frame at the bottom using foam strips. Stamp the pocket image with Vibrant Fuschia ink and cut with coordinating die. Distress the pocket with the same ink and adhere on the card front as shown. Stamp flowers in blue and yellow ink. Using any marker of the same colours , add some coloring inside the flowers. Cut with matching die. 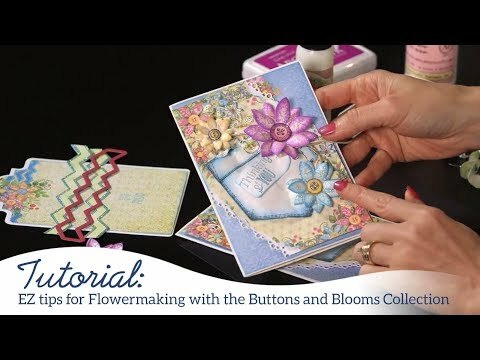 Stamp and cut buttons to coordinate with the flower colors. Stamp the leaves in Library Green ink and color with Leaf Green ink using the sponge daubers. 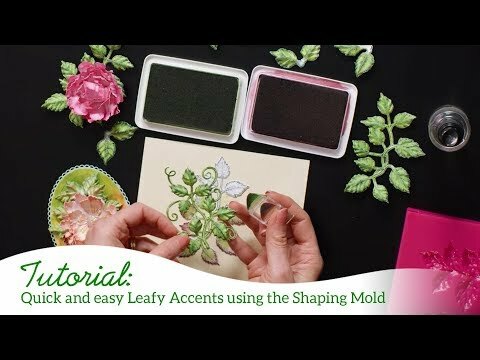 Cut the leaves with matching die and shape them in the Leafy Accents mold. Add the leaves on the card using the clear designer glue. Add the flowers. Stamp a sentiment from Hand stitched Accent Cling stamp and add some stitched lines. Add this to the card. Finish the card with adding Glossy Accents, clear water droplets and twine to the card.